Starting from March 2014, the Ministry of Public Security took the lead in organizing the implementation of the national standard declaration of the key standards for the grade protection of new fields of information technology, which indicated the grade protection has officially entered the 2.0 era. In addition to the general requirements for the general-purpose systems, it also adds the security and scalability requirements in cloud computing, big data, mobile Internet, industrial control, and the Internet of Things, which has enriched the content and requirements of protection. The general requirements also simplify part of the content, and add other requirements of wireless network and centralized network monitoring. Training objects: the technical management personnel, technical seniors, staff engaged in the field of security technology and all employees of enterprises and institutions of different industries, such as operators, finance, energy, electricity, tobacco, medical care, education, etc..
Training content: network security threats, offensive and defensive technical principles, malware analysis, and security coding standards, etc. Users can select courses according to their needs. Training objectives: based on the business scenarios of common industry, to help users understanding common measures of security risk management, effectively improving risk management, suppressing security incidents, promoting standards of customer security and risk management, enhancing safety awareness and cultivating their own capability to eliminate potential threats and vulnerability. Training object: the staff involved in security planning and security construction programs, and the mid-level and senior managers engaged in information security work. 1)Certification training for security management and security technologies, such as CISA, 27001LA, ITIL Foundation, COBIT Foundation (Information Systems Auditing Standards), CISP (Registered Information Security Professional), CISSP (Registered Information System Security Engineer), NCSP, etc..
2)Interpretation of information security standards, grade protection construction and information security assessment.Training objectives: users can improve their security awareness, security management knowledge level, security management operation capability and practical operation level of information security management work through the training of Antiy. 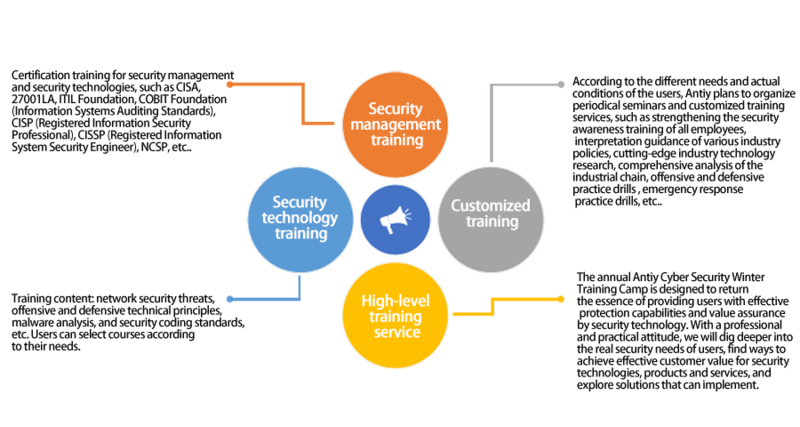 According to the different needs and actual conditions of the users, Antiy plans to organize periodical seminars and customized training services, such as strengthening the security awareness training of all employees, interpretation guidance of various industry policies, cutting-edge industry technology research, comprehensive analysis of the industrial chain, offensive and defensive practice drills , emergency response practice drills, etc.. The annual Antiy Cyber Security Winter Training Camp is designed to return the essence of providing users with effective protection capabilities and value assurance by security technology. With a professional and practical attitude, we will dig deeper into the real security needs of users, find ways to achieve effective customer value for security technologies, products and services, and explore solutions that can implement.